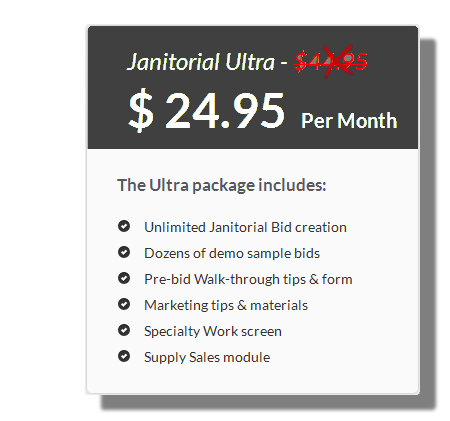 Janitorial Bidding Software that's state-of-the-art. Make an outstanding first impression! Let the CleanlyRun online system guide you step by step to professional and ready-to-deliver cleaning proposals for Janitorial, Construction Clean, Apartment Move Out and Residential bids. The system also includes Specialty Work and Supply Sales for the all-inclusive monthly price of $24.95 USD! We get it... It was a long recession and a slow recovery. And tough times mean that proficient janitorial bidding, professionally presented, is more important than ever to give you the edge over your competitors. Successful bidding is an acquired skill that takes many years to hone. But you don't have to learn the hard way and you don't have to deal with desktop software that you need to install and update. Instead, bid like a highly experienced expert - conveniently and affordably - from any computer browser. Your resulting sleek and professional proposal, complete with Table of Contents, is your winning edge! How can you profitably bid a job if you don't know how much it costs you to do it? 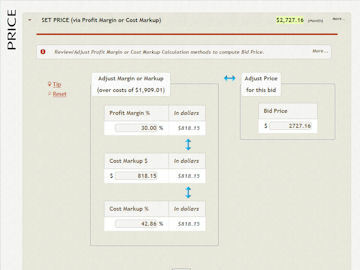 With CleanlyRun Janitorial Bidware, you can see your costs and then adjust the default Profit Margin as you see fit. Providing the information to bid confidently and the flexibility to tweak the price as needed is just part of the reason that we get so much positive feedback on our "Workloading and Pricing" screen! CleanlyRun uses powerful behind-the-scenes Business Rules based configuration technology -- an agile programming framework that was previously available to very large enterprise only -- to capture the expert bidding knowledge that drives our software. Our development efficiency is passed along to you in our unmatched low pricing. 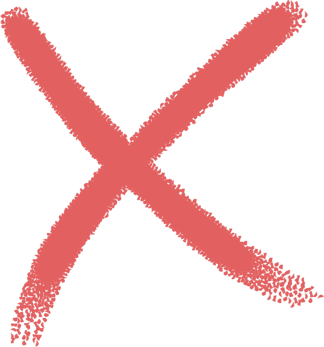 Our innovative janitorial bidding software is your winning edge! CleanlyRun has streamlined our bidding process. Here at Labeeg Building Services it is the only program we go to for our proposal needs... With a company our size we need programs that are consistent and work every time; we get this with the CleanGuidePro software. We are eager to see what new features and programs this company adds in the future. Each and every time I've used this program I have won the bid and the client has commented on how clean and professional my proposal was. So far I won and completed 4 bids, although I am new in this business. This program helped land a major contract for our company. We got compliments from the bid selection staff on a very professional bid. To date, we have won 4 bids using this system. It's best feature: Simplicity of use and suggestions for users. 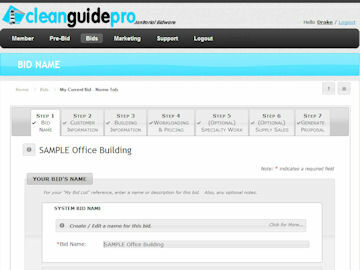 We have used the CleanGuidePro for 3 bids and have secured 2 in our first month of subscribing. I love this program! It's easy to manipulate and make your proposals unique to your specifications. 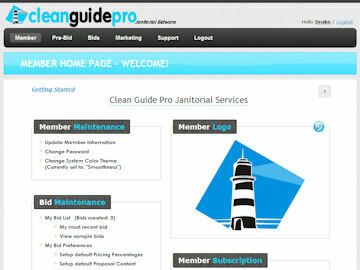 Our business kicked off earlier this year and we've now won three bids using CleanGuidePro! 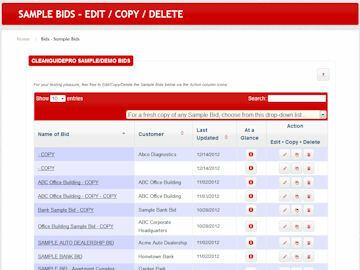 The tool is fantastic and customers have admitted the detailed and professional bid won them over each time. We are a start up... never done this before. ... Your bidding software really made us look like pros. We literally won 3/4th the quotes we bid on right out of the gate and much to your credit! 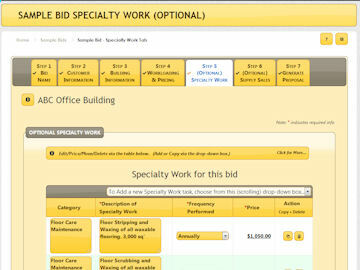 Easy to use, Professional Bid Proposals. We won our first 2 bids using this software! The software is very easy to use. I love that the pages can be edited so that you can take out the parts you do not need. The level of detail is impressive. 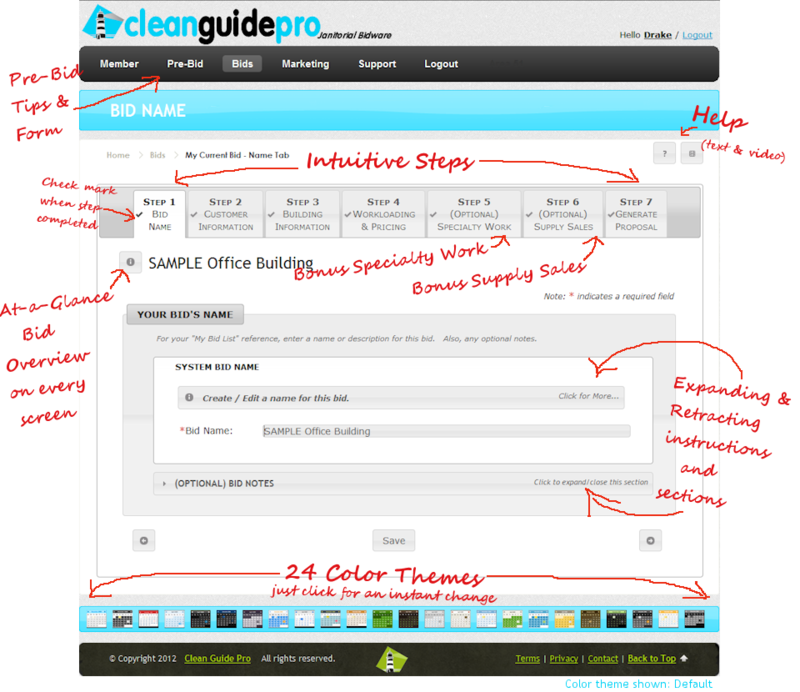 I submitted my very first bid using CleanGuide Pro - And WON! 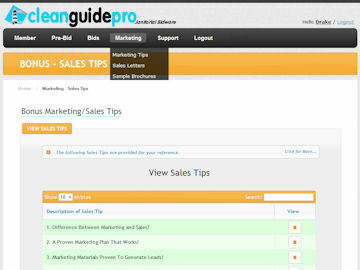 CleanGuidePro is the best bidding software on the market. For a low monthly fee you will be creating professional proposals in half the time as you would by other means. Great job on your bidding software! Excellent price and great screen shots. 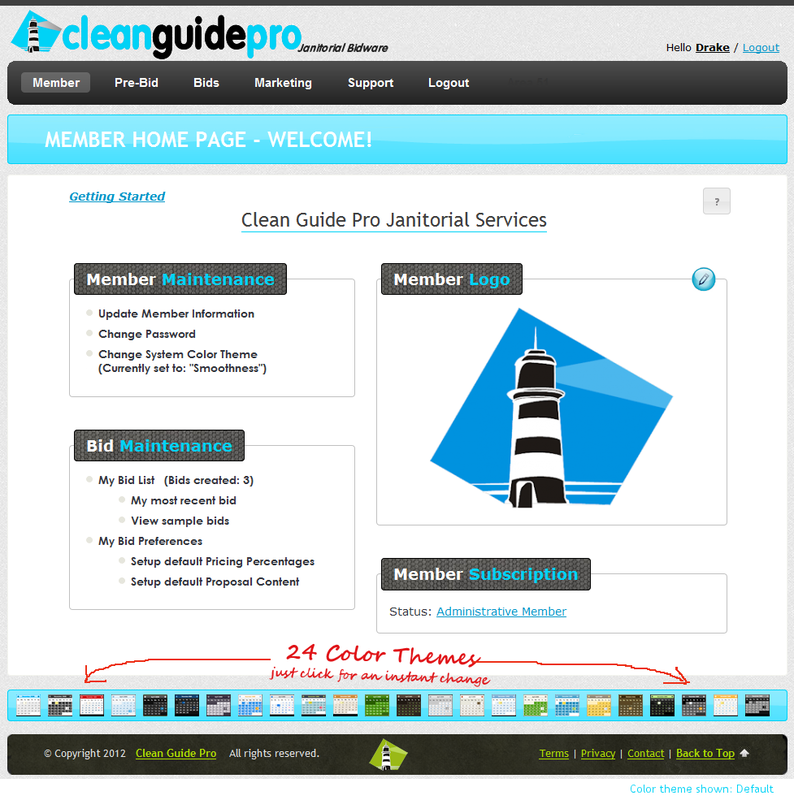 We have used other software in the past, but none can compare to CleanGuidePro. We love It! The first bid we placed was accepted. They were impressed and we definitely looked bigger than a two person crew. Easy to edit and complete proposal. The program is serving Green Office well and saving us a great amount of time in preparing winning client agreements. Unlimited, ready-to-deliver Janitorial, Construction Clean and Residential proposals. You're guided step-by-step through the bid creation process (which includes written and video Help and Tips, plus lots of demo and sample bids). At an unmatched low monthly price! 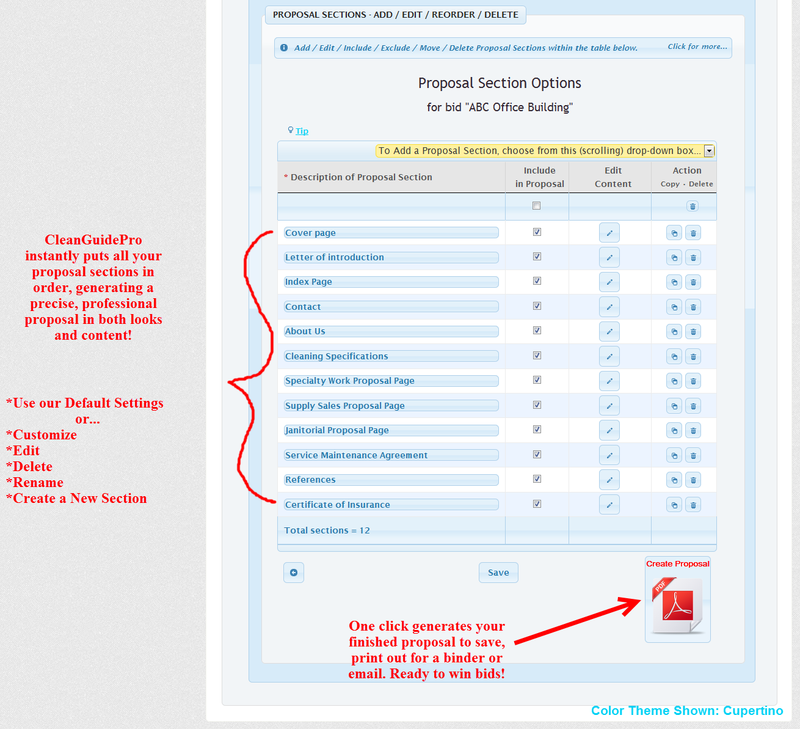 Rearrange, include or exclude any of our standard janitorial proposal section templates. Or design your own. Also, include photos/logos/images on any page and/or upload additional supporting documents (for example, Proof of Insurance). Feeling blue? Or red? Or cyan? 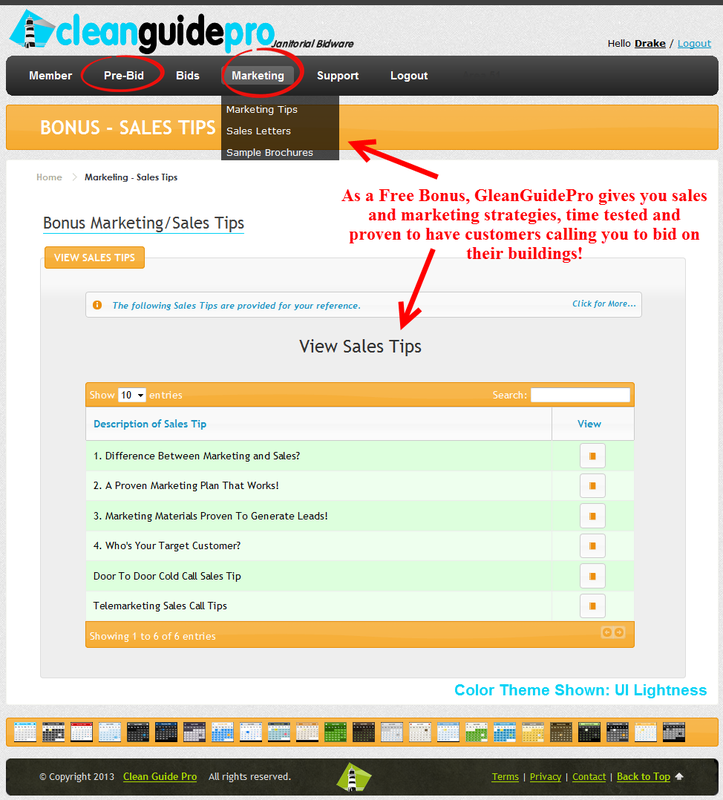 Color preferences differ greatly, so we incorporated a little flexibility into our software's "User Experience". Specifically, we offer 24 diffent color themes, ranging from light and subdued to dark and neon. Create an accurate and professional cleaning proposal in minutes rather than hours! 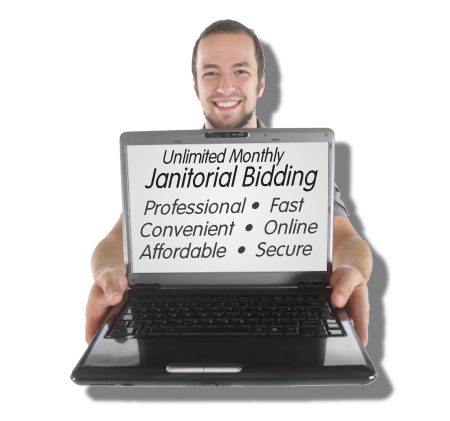 We've automated the best practices of highly experienced janitorial professionals so you can quickly bid with confidence. Special requests? Not a problem. CleanlyRun includes standard on-request janitorial specialty jobs (such as floor scrubbing and waxing, carpet cleaning, etc.). Detailed pricing tips included. Exceed expectations and offer customer consumable supply items (such as paper towels and bathroom soap) in any of your janitorial proposals. 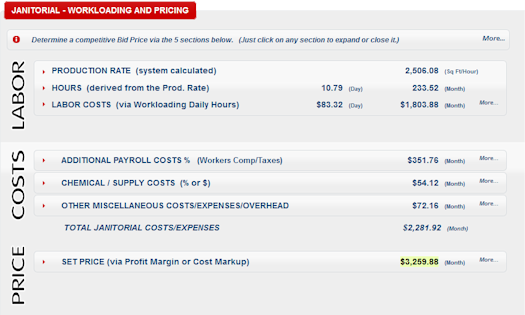 CleanlyRun provides a list of supplies that you can edit and price as you see fit. Choose from dozens of building and facility types, from small to large! Plus combination facilities like Office/Warehouse! Building-specific areas and cleaning specifications are generated for your convenience in every janitorial proposal. Add, edit, rearrange or delete these areas and tasks as you see fit. Or create your own. The key to accurate, competitive and profitable pricing is to first determine your costs. Then we'll focus on your Profit Margin for the job! 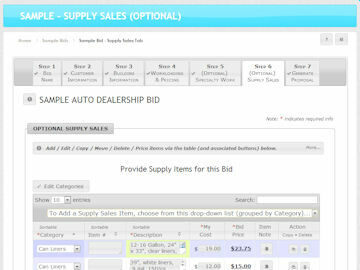 All throughout the bid creation process, you can click the At-a-Glance icon to invoke a pop-up box that displays summary information about a bid. Especially useful when reviewing your "My Bid List" master screen. CleanlyRun Janitorial Bidware is straightforward to use, but there's lots of help - both written and/or video - on every screen. Plus you can contact our Support Team. 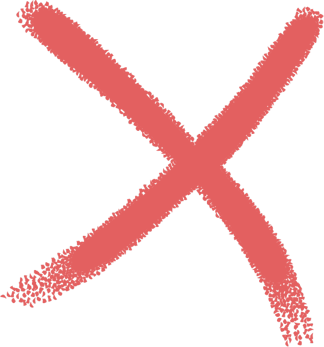 CleanlyRun's Sample Bid section contains over 3 dozen demo janitorial bids (of various types of buildings) for you to explore. If, unlike most folks, you choose to build your own proposal templates from scratch, feel free to use the "My Data" drop-down list to insert data placeholders on any page. All code developed and maintained by a U.S. staff. All data stored and backed up using state-of-the-art security measures (on U.S. servers). We're in the cloud! Access our online web-based software 24/7 from any computer. No software to install or upgrade. No long term contracts. Convenient monthly plan that can be canceled at any time with one click. 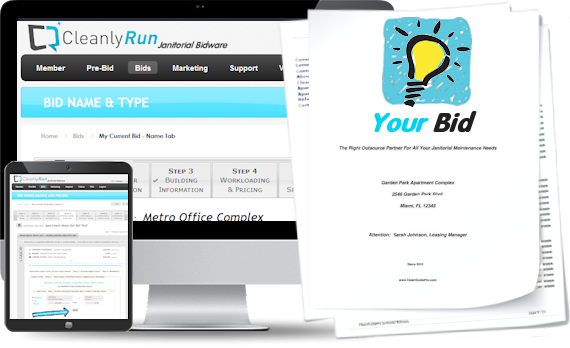 As a free bonus, CleanlyRun includes additional help in the form of a Pre-bid Walk-through section (with form and tips) and a Marketing section (sample letters/brochures). 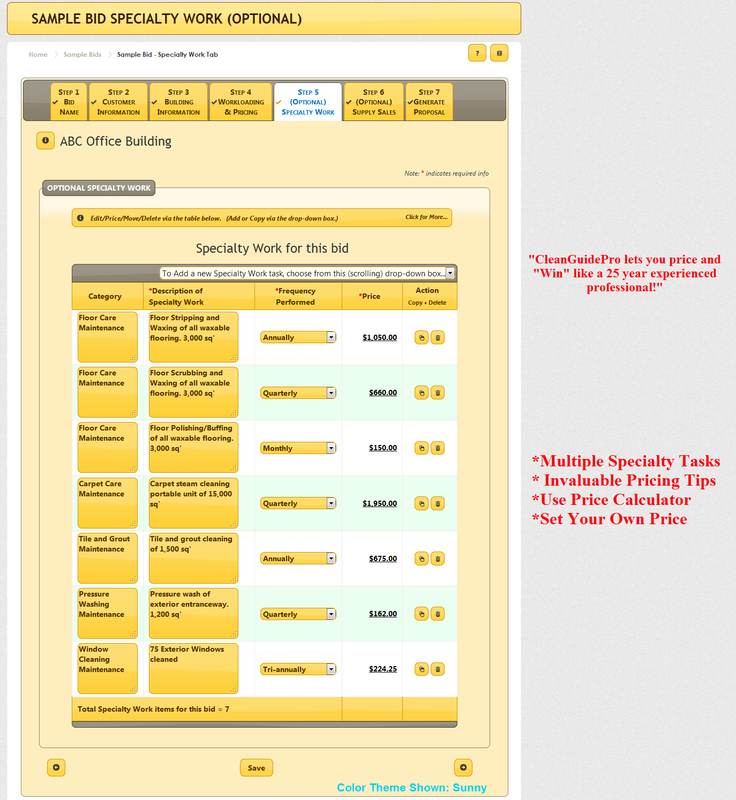 Sure, we're proud of our janitorial bidding software, but what truly matters is what it produces - your proposal! We have a standard set of janitorial proposal pages that we populate for you, but you're not limited to those. You can truly have it your way! And then you can save, print, e-mail and/or reuse the proposal... By the way, did we mention that it comes with an indexed Table of Contents? 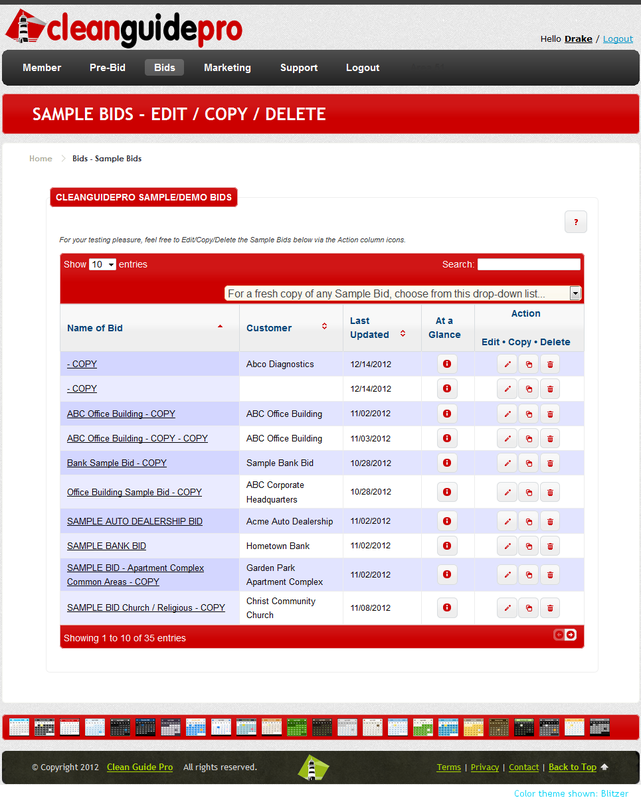 No matter how many janitorial bids you've created, you can quickly sort, search, add, edit, delete or copy them from one convenient spot - the "My Bid List" screen. 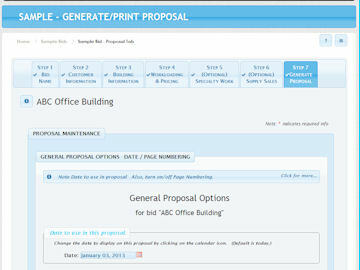 CleanlyRun guides you through 7 steps - (two are optional) - to quickly create a beautiful janitorial proposal. Plus there's written and video help on each screen. CleanlyRun's unique janitorial pricing section enables you to quickly explore multiple pricing scenarios and arrive at your optimal bid price with confidence. The Specialty Work screen includes typical on-request janitorial specialty jobs (i.e. floor waxing and carpet cleaning). 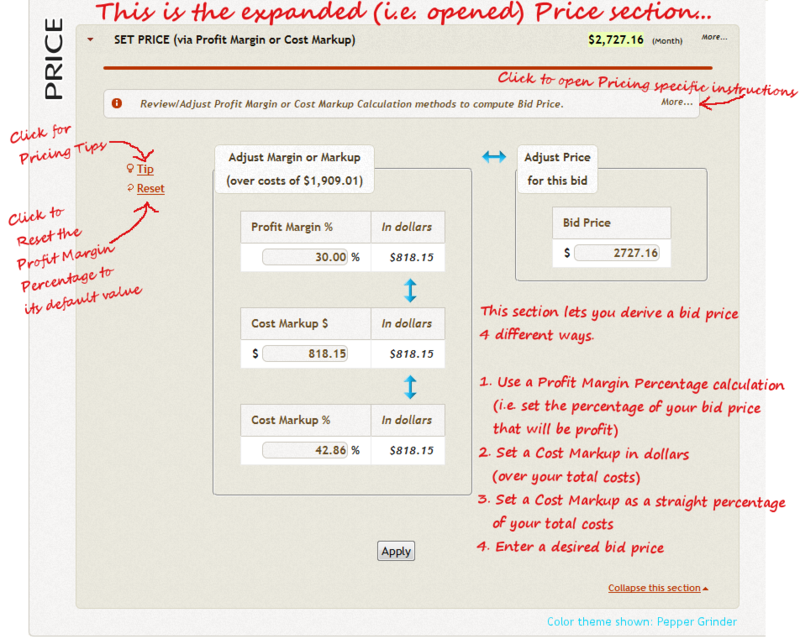 Plus pricing tips. CleanlyRun provides a list of customer consumable supply items that you can include in your janitorial bids. Or add your own. 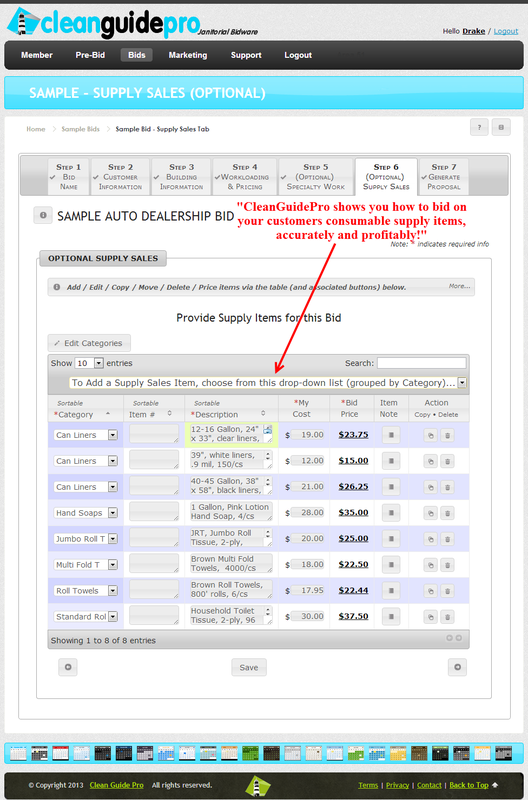 We give you bonus tools and tips to help you before you even produce the first bid. i.e. Pre-bid Walk-thru Form and Marketing Materials. An all inclusive plan offered at an unbeatable monthly price! Have our customers say, "How did I ever get along without this tool?" 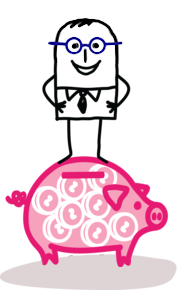 Since then, our customer feedback has been overwhelmingly positive regarding value for cost. For $24.95 - about the price of having a large pizza delivered every month - there's no limit on the amount of bids that you can create to grow your business! Start putting CleanlyRun's winning edge to work for you. Sign up today for a free, no risk, no hassle, 30 day trial. Yes, I want to create awesome cleaning proposals!